A large temblor registered 133 kilometers (83 miles) south-west of Kokopo, according to USGS. The revised data showed the epicenter to be 63 kilometers under the coast of New Britain island. The quake was followed by a 5.9-magnitude aftershock just 10 minutes later. The series of aftershocks continued with 5.6 and 5.2 tremors. There were no immediate reports of serious structural damage or casualties and the coastline around the epicenter of the quake is sparsely populated. Two lower-magnitude tremors were registered in the area last week, but the Tuesday quake was considered more alarming due to it being shallow. In Kokopo, severe shaking of buildings caused people to rush into streets in panic, according to local media. 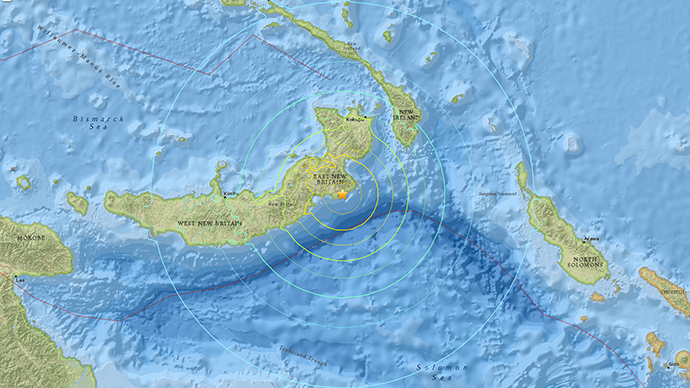 Twitter reports also said tremors were felt in the capital city of Port Moresby, which is 700 kilometers away from the epicenter of the quake. PTWC has revised the initial warning, saying that tsunami waves reaching 0.3 to 1 meter above tidal level were expected only on some coasts of Papua New Guinea.